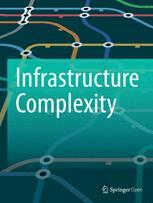 Infrastructure Complexity is a fully open access journal published under the brand SpringerOpen. The journal aims to understand, shape and design complex systems and services that emerge from a collection of interacting physical objects and social actors in an urban environment. It aims to propel sustainable urban systems, through urban metabolism, and is rooted in the fundamental understanding of urban (infrastructure) systems and services. The intertwining of our technical and societal processes has been taken to great lengths. Technical, physical and human components are increasingly interrelated: the high degree of dependence of our urban society on a functioning energy supply, the far-reaching penetration of ICT systems and services in the control of our society, and the impact of electrification on mobility. Such urban ecosystems need to adopt and accommodate technology and innovation and they need to adapt to dynamic economic, regulatory and social value systems and regimes, as well as to changing global trade patterns. This requires a meta-discipline, as a collection of disciplines, that understands the engineering intricacies of the technology, as well as the economic and governance complexities of such systems. Novel engineering systems also bring along the perspective of new service systems. Whether they are designed to enhance individual safety, health and human well-being, promote sustainability, or increase productivity, technological and engineering systems have to be understood as part of a complex urban system. This creates fundamental uncertainties and inherent risks, as well as opportunities for robust and agile engineering, entrepreneurship, and innovation and sustained strategies of adaptation.